This seasons florals are here! 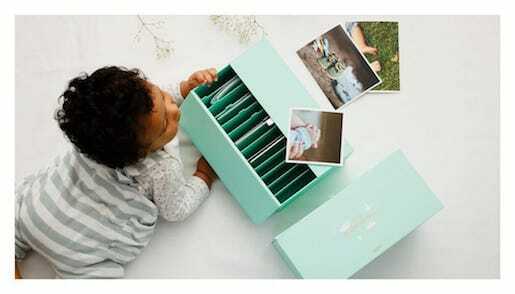 The Memory Box Baby is the great baby gift parents have been dreaming of. Design and handy, this souvenir box is to be filled throughout time during the baby's first year. The first feeding bottle, baby sleeping, his first tooth, his little feet, the last pregnancy moments, first visit to maternity, the first month, your baby is the world to you! Obviously a photo book is something of a classic, but this one has our own unique twist. We wanted it to look like a book (it’s the best way of telling stories after all) and to hold up to 150 photos. Photo printing in a blink, hold your memories in your hand, in no time! You're on mobile, Cheerz too! Print all the photos from your phone with our app for iOS and Android! Hey you! If you're reading this message, you're most likely looking for a website to print your loveliest photos and transform them into fabulous products... are we right? Well, you've come to the right place. Yup, with Cheerz you simply choose the style you want to print in: Classic, Square or Retro prints. There is something for everyone! You'll also discover our Photo Albums, Posters and other funky walk decorations that have three things in common - design, quality and simplicity! Say goodbye to endless hours spent in front of your screen or phone... Cheerz is photo printing, as efficient, and simple, as it comes - which in turn makes the satisfaction of receiving your item(s), or watching someone open their gift, that much better. We like to think of ourselves as the wizards of photo printing. We want to create the best, most magical, photo printing experience for you of all time. We all have so many photos of special moments - holidays, travels, weekends, weddings, honeymoons, babies... and that's why we created Cheerz. Turn those zeros and ones in your phone into touchable mementos, on our website or with our app. Not to brag, but we have it on pretty good authority (our customers) that many think it’s the best photo app around. Between impersonal files and the lovely memories in your hands, the latter will always win... get the picture? At Cheerz, we're a bunch of happy people and we're here just for you! A photo album for any occasion!